The agent you choose to represent you when selling or buying your home plays a major role in the achievement of your real estate goals. Our team provides the highest level of service and experience to our clients. Our goal is 100% customer satisfaction. We offer over 30 years of combined Real Estate, Marketing, and Appraisal experience in Burlington, NC. Selling a home in Alamance County, Guilford County, Chatham or Orange County? We will help you price it right, stage it to appeal to buyers, and market it to all other agents and our extensive network of prospective buyers. We feature our listings on hundreds of search sites with professional photos, visual tours, and social media coverage. 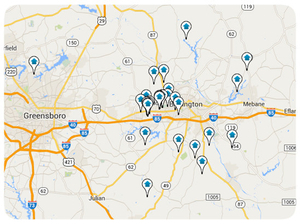 We have listed and sold HUNDREDS of properties in central NC. Our track record and client testimonials speak for themselves. Ask us for a copy of our sold homes list and our marketing plan. Buying a home in Alamance County, Guilford County, Chatham County or Orange County? We offer free buyer consultations. Our buyer's agents only work with buyers and they have the inside knowledge you need to ensure you have exposure to all available homes for sale. They preview all available homes and advise our buyer clients on the best way to find the right home and get the best deal on available properties. We also have a great track record in winning in multiple-offer situations. Choosing a weak agent could mean paying more and having more frustrations throughout the complicated home-buying process. Buying or selling a home is likely one of the largest monetary transactions you will take on in your lifetime. Trust our experienced team to represent you and work to get you the best deal with the fewest stresses. Call Brad Barbour or Hilary Hill today to get the process started!